From shooting line to the double haul, take the next step in your progression as an angler! Maybe there's a saltwater trip coming up in a windy place. Maybe you've been away from the sport for some time and you're ready for a refresher. Or maybe you're just interested in advancing your skills on the water and increasing your rate of quality presentations. Trust us, the fish will notice! This class picks up just after you've mastered the overhead cast and covers the mechanics of loading the fly rod. We address shooting line, single and double hauling, power application, casting in the wind and casting for distance. 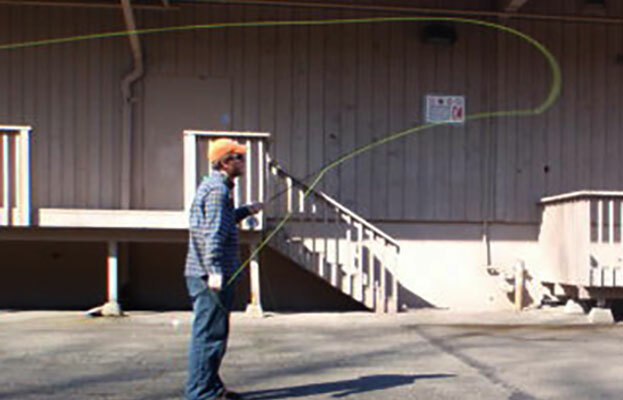 Not only will you learn the skills necessary to comfortably cover more water, but you will gain the conceptual tools necessary to diagnose and improve your own casting without the aid of an instructor. We offer this class in three separate sessions. The first session will be from 7:00 PM to 9:00 PM at the shop, and it will cover the conceptual theory behind fly casting technique. The second session will be from 9:00 AM to 12:00 PM at a local park where we will apply these ideas to the techniques in question. The third session is an optional, follow-up session up to three weeks after the class. Although it is not required, many students use this session to troubleshoot continuing issues and to reinforce progress achieved.